At the Howard & Sons Pyrotechnics manufacturing and special effects department we are much more than simply involved in the fireworks manufacturing process – we produce all of our in-house designs at the Howard & Sons fireworks manufacturing facility in NSW … from scratch. Fireworks pioneer Howard & Sons Pyrotechnics first began producing its own bangs and colourful crashes in the 1920s, when fireworks imported from England would become damp on the long sea journey and often fail as a result. Now, with nearly one hundred years of experience and countless well-guarded family secrets, Howard & Sons, Sydney, has forged its way ahead of the competition throughout Australia and far beyond its borders. We believe in excellence at every stage, on every stage. If you are looking for experienced and ground-breaking pyrotechnicians to uniquely design and produce indoor, outdoor, huge-scale or wedding fireworks for any local, national or international event, please contact the Howard & Sons Sydney office. Thanks to our many reliable contacts in the complex field of firework logistics, we can also bring your commissioned, one-off designs to any corner of the globe. We haven’t yet come across any other firework companies with four generations’ worth of pyrotechnics knowledge. You need only look at our portfolio to see that the Howard & Sons NSW manufacturing facility really does bring each new, cutting-edge or unusual design to dazzling light. 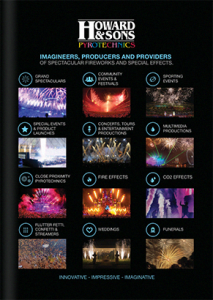 Join a long list of extremely satisfied clients and audiences and have Howard & Sons pyrotechnicians create, manufacture, produce and present your awe-inspiring, explosive and crowd-pulling event, or event backdrop. With specialised teams for one-off or multiple date, indoor or outdoor special effects for theatres, private and corporate events, bands, movie shoots, photo shoots, circuses and sporting events, we know exactly what is possible, and what is safe. For the largest audiences, Howard & Sons Grand Spectaculars combine futuristic displays with centuries-old ingredients. The Howard & Sons special effects and firework company is well used to providing complete turnkey solutions, starting at the drawing board and ending with incredible multi-media displays that have won both awards and admiration all over the world. All of our pyrotechnic products and materials are carefully sourced, designed, tested, assembled, stored and transported according to the law of the appropriate district or country, in addition to our own, stringent guidelines. Give us a call today and find out how our fireworks manufacturers can turn your unique, heart-stopping special effects idea into a reality. Howard & Sons Pyrotechnics creates the shows you had only ever imagined in your wildest dreams. For all your manufacturing, special effects for theatre, concerts or movies.